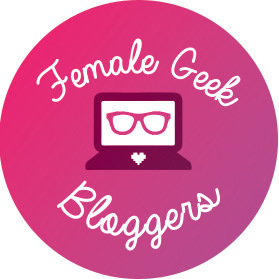 Last week, A Geeky Gal was nominated for the Blogger Recognition Award by Libarah! They are a new follower here on the blog, and their blog is all about cooking. They must be doing something right as they have been racking up their own blogging awards lately and raking in new followers! Thanks again Liba for the nomination. It’s very much appreciated. Thank the blogger that nominated you and give a link to their site. Do a post to show your award. Give a summary of how your blog started. Give two pieces of advice for any new bloggers. Select at least 15 other bloggers for this award. I’ve mentioned before how my first blog started as sort of an online journal and a place for me to get things off my chest. I realized that most of my writing was about geeky things that I enjoyed with a few personal posts sprinkled in. I knew if I wanted to pursue blogging more actively, I needed to rebrand and find a better host site. Thanks to a blogging friend, I found WordPress, and A Geeky Gal graced the internet with purpose. That’s literally the best thing you can do when you first start a blog. Write as much as you can and as much as you feel like writing. Be active in the blogging community. The community is very welcoming, and we bloggers love to help! Want to know how we did something for our site or how we come up with writing topics? Just ask! We’re friendly around here. Start by joining a Facebook group and just introduce yourself and your blog! I am actually going to tag everyone in the upcoming blog collaboration The Games that Define Us that is premiering next month! Give these bloggers a follow and read up on their blogging advice on their award posts! Congratulations on this fun award nom! Thank you for the nom! And congratulations on receiving this award! You’re welcome! And thank you! Thank you! I’m so glad I could introduce you to some new blogs!